Advertising Secrets to Build Your Badass Personal Brand, Earn Passive Income, and Become an Influencer on Instagram, Facebook, YouTube, Twitter and More! Struggling to grow your business, while you’ve seen your competitors find success easily? Or your followers have become stale, and there’s been a lack of engagement? You’ve heard about the growth of social media marketing, and the power of influencer marketing, but what exactly is that? This audiobook will help. Social media marketing is simple. It can broken down into two key factors: provide real value and be consistent. This will help you capture an audience, which you can then turn into paying customers. Smash those sales goals of yours, or drive more traffic to your website; all with the help of social media marketing. You’ll learn how to do all the secrets for success in Social Media Marketing for Beginners 2019. Is social media marketing for you? Thousands of dollars are spent on traditional advertising techniques, only to see little to no return. Nowadays, Facebook or Instagram ads will outperform any form of traditional marketing, because they are highly targeted. There are more than one billion active monthly users on Instagram alone. In 2017, there were eight million business profiles on Instagram. These markets are only going to grow in the next few years. Why is your business not already on there? This audiobook will be your guide to social media success. Use its actionable strategies to build your business or personal brand on Instagram, Facebook, Twitter, Pinterest, LinkedIn, and more! I will show you step-by step how to start, build, and grow a powerful social media marketing strategy, specifically for your business. Other guides tell you BS strategies such as buying followers or fake likes. Those might work in the short term, but I am here to provide you with long-term value. Real followers, who we will turn into real paying customers. How to identify your perfect target audience and where to find them! Real marketing strategies that you can use on Facebook, Twitter, Instagram, Pinterest, and more! Click "Buy Now", and let’s build your business. Excellent book, full of great resources. This is a must-have for all businesses who want to use social media to market themselves. This is the latest and standard 🙂 book out there in 2019. The best strategy to build up a loyal audience using Facebook, Instagram, YouTube, Twitter and Pinterest organically in an harmonious and congruent manner. 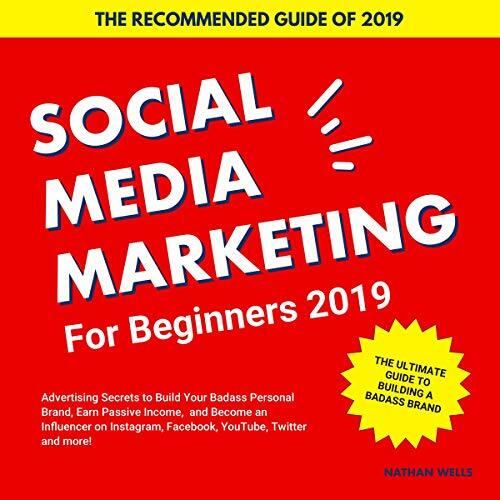 If you are an entrepreneur and do not know how you can use or need to improve upon your social media marketing skills this audiobook is for you. It will take you from a newbie to an expert in no time. Change in a blink of an eye. You can tell that so much effort has gone into creating this book, the author clearly has a skill in social media marketing and he has shown this within this book. He talks about the best strategies you can apply to your business in 2019 and does not just focus on one social media marketing platform instead he focuses on many platforms. Addressing it clearly that it is shooting yourself in the foot if you only focus on one social media platform, as if that one platform stops working you business can change in a blink of an eye. Social media marketing is purely gold, it can teach you so much from an efficient standpoint. If you want to fully transform your business or clients business today, my first piece of advice would be to get this book now; as if not there is so much that you will be missing out on. All in all the best social media marketing book i have heard in a long time. Very good book for social media marketing department. This book is like the principal place to start planning your brand awareness plan. I have no doubt that many people who are unaware of the many options available in our everyday social media platforms, will certainly be surprised and find this book to be an utmost essential guide. What a great resource book for marketing your business through social media. Here author has done a remarkable job of giving you everything you need for your business to succeed. He gives links to follow, resource references, videos, and a fabulous tool book that goes with it for all your free social media tools. Easy to understand, book about SMM. You need to commit time to doing what is suggested in this book but you don't have to be a web wizard to do them. 😁 This is a very comprehensive, yet easy to understand, book about SMM. I've only gotten through the first chapter but there is SO much useful information! A definite must for learning everything there is to know about SMM. Lots of nice info. Highly recommend this audio book for anyone planning a social media campaign across all the major platforms. This book will give you many useful tools for social media marketing, I would recommend to anyone who's interested in learning social media marketing.